There was never any question in my mind that I would go to college straight after high school. That said, I didn’t put a hell of a lot of thought into which college I should go to. I only applied to one: The University of Washington (UW). I based this decision on some pretty loose criteria: It was a university (as opposed to an industrial or art school), it was in Washington (so I wouldn’t have to move from Seattle), it had a very good cycling team (national champions at the time), and I had a vague sense, gathered from various sources, that their graphic design program (termed Visual Communication Design, or just “VCD”) was pretty decent, too. For some reason, USA Cycling categorizes trade team racers numerically (rising from Category (or “Cat.”) 5 to Cat. 1 – then pro), while collegiate racers are separated alphabetically (from “C” or “D” up to “A”). Perhaps these schemes are contextually appropriate. Both caste systems are based primarily on how good you are at racing (seems fair), as opposed to how old you are, or what kind of a bike you ride, or anything else. I was a USCF Cat. 3 and rising upon entering the UW, and that put me right on the bubble for the boiling-hot Husky “A” team (limited to the top-eight riders). Indeed, the UW team was so dominant that division races were kind of a joke. The collegiate scene in the Northwest just isn’t that big (or wasn’t, then), so bringing our full squad to any event was like bringing an Abrams Tank to a knife fight. The top four or five riders at the UW were also four or five of the top racers in the country, and the other 20 or so riders weren’t too bad, either; other teams were lucky to field four or five riders, total. Sounds great, right? Nope. Boring. Really boring. The team chemistry wasn’t exactly “A” quality, either. I went to a few races and left it at that. They didn’t need me (I think they won nationals that year, too) and I didn’t need them (I was happier just racing in USCF events). By chance, though, I ended up designing the Husky Racing uniforms the next year. I was waiting for a bus one day when Ben, one of the team riders walked by. (At 21 or 22, Ben was one of the best Cat. 1 racers I’ve ever seen, unquestionably destined for the pro ranks before a meteoric case of burnout around age 23 – about a year after this encounter – saw him sell off all of his bike gear for surfing and Solo cups.) We chatted for a few minutes and, after ascertaining that I was aiming to be a graphic design major, he offered me the Husky job. Known as “kits” (or “strips” if you’re really Euro), cycling uniforms were, until about ten years ago, all about the jersey, with some minimal artwork on the shorts’ side-panels for good measure. In recent years, though, strip design has grown to reach from head-to-toe, front-to-back, and then some, and good measure is hard to find. In any case, I had wanted to design a team kit from the day I started racing, so this was an opportunity I couldn’t pass up. But, to be honest, I didn’t really design the UW kits. Ben and a couple other guys on the team already knew what they wanted; I just executed the idea. It was a minor coincidence that it was an idea that I had always wanted to execute on a bike jersey, anyway: the classic, hot-rod-inspired “flames.” It seems a bit trite to me now, but I’m glad to have had the opportunity to get it out of my system. Just executing this idea was no mean feat. The way custom jerseys are manufactured is a strange and tricky process that starts with “sublimation,” in which the design is transfered, one color at a time, to special papers that are then pressed into the fabric, which is then cut to pattern and sewn together to make the finished uniform. If anything is askew in this process (e.g., the paper creases, the fabric isn’t lain out perfectly, the humidity is off by a few percent, etc. ), the whole thing is screwed. Since quantities for these jobs are often very low, much of this has to be done by hand, which leaves a lot of room for error, depending on whose hands are at the wheel. Suffice it to say, it’s a lot more involved than screen printing a logo on a T-shirt. Ironically, this exacting process is often handled by small, quirky, low-budget operations that mirror the small, quirky, low-budget operations of their local bike-team clientele. Their facilities are modest, and their technology is often from an entirely different era. For this jersey, I had to draw and hand-cut all of the graphics in Rubylith at full-scale on a sheet of clear acetate about the size of a dining room table. This is a process that had died out of the greater world of graphic design in the late 1970s, but was alive and well in the bike-kit design world of 1997. My lack of prior knowledge with this process and general design naïveté shows in some of the details here, but overall, it seemed to work out alright. 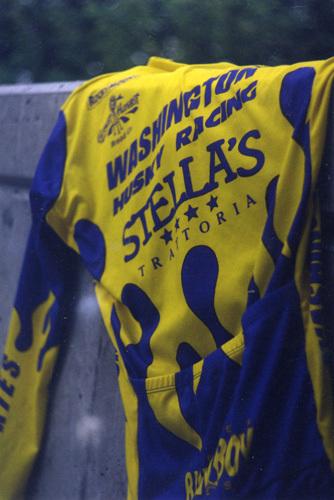 As I’ve mentioned before, designers rarely get credit for any of their work, so the majority of the team had no idea who made the kits happen, but they wore them for at least another year or two thereafter (in the world of bike-team-wear, this is roughly equivalent to a man living to be 1000). Perhaps the only thing more palpable in the field of bike-team work than the lack of credit is the lack of compensation. This was an exception, though. Ben let me cut a good swath in the first clothing order. The shorts never fit – damn quirky manufacturers – but I still wear my long-sleeved jersey every so often, just to show my team spirit.